Sharjah: With an increase in the number of grievances reported by Indians in the UAE, a new support centre will help them address their concerns and spread awareness about their rights. 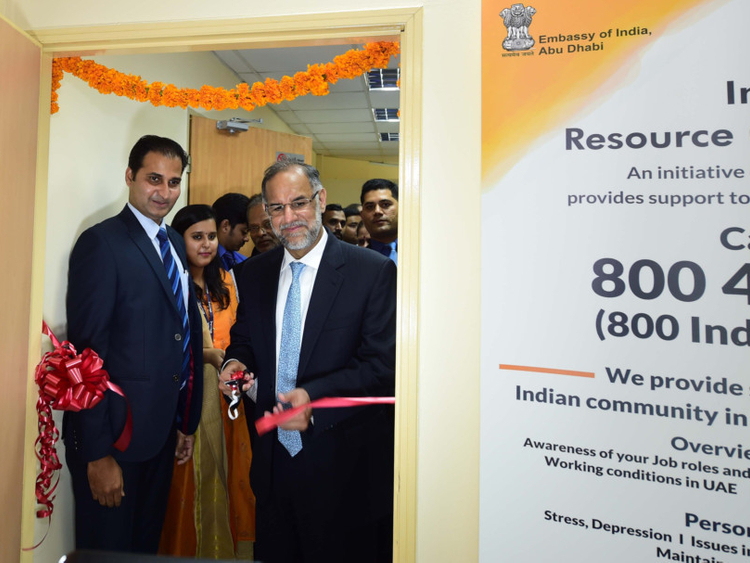 Indian Ambassador to the UAE Navdeep Singh Suri opened the Indian Workers Resource Centre (IWRC) in Sharjah on Sunday. The facility located on the 22nd floor of Damas Tower (Burj 2000) opposite the Central Post Office is the second office of the IWRC in the UAE after the one in Dubai that currently caters to Indians from all seven emirates. Inaugurated in November 2010 by the then Indian President Pratibha Patil, IWRC Dubai runs a 24-hour toll-free helpline (800 INDIA or 800 46342) that offers assistance to Indians in distress in the UAE. India’s Ministry of External Affairs decided to open the second centre in Sharjah considering the high number of Indians living in the emirate and easy access for those living in the Northern Emirates. Suri said the new office building was chosen considering the fact that it is in a central area and also houses the BLS Centre, the outsourced agency which provides Indian passport and visa services. The services being provided at the IWRC Dubai at the Silver Tower, Cluster-I in Jumeirah Lakes Towers will now also be offered at the new office in Sharjah. The walk-in counter at the new office will receive petitions directly from Indians in distress from 8am to 8pm from Saturday to Thursday. The centre also provides counselling by experts in legal, psychological and financial matters by phone or email and in person. “The centre will create awareness about the rights of migrant workers and also the contact details of the IWRC for any Indian in need to seek legal, psychological and financial counselling. A social media campaign is already on in this regard,” said Suri. While the Sharjah IWRC will run the walk-in centre and conduct awareness programmes, the helpline for distressed Indians will continue to be operated by the Dubai office, he said. Dinesh Kumar, first secretary (community affairs) at the Indian embassy said there has been an increase in complaints about non-payment or delayed payment of salaries, abandonment of workers by employers who have shut down businesses and workers facing visa cancellation issues. “The number of counsellors with IWRC will be increased to manage the new office if required,” he added. The IWRC helpline offers assistance in five languages — Hindi, English, Malayalam, Tamil and Telugu. All the calls are registered and a reference number is given to the caller for future reference. A date and time is given to callers for counselling sessions, which can be conducted in various parts of the UAE if required. At least four awareness campaigns such as talks by experts, seminars, panel discussions or question and answer sessions are organised at labour camps every month. The individual counselling sessions are arranged in case of serious issues. “With 2.7 million Indians in the UAE and 70 per cent or more of them blue-collar workers, there is no way the embassy can reach out to every individual or respond to every single complaint,” the ambassador said, highlighting the importance of the service of running IWRC outsourced to private service provider Alankit Assignments Limited.